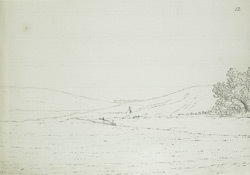 A distant outline view in ink of Gloucester House, from Radipole near Weymouth in Dorset. At the time Grimm made this drawing, the house was used by George III as a summer residence. It survives as a hotel.